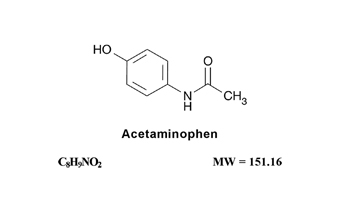 Proprietary Name: Acetaminophen And Codeine Phosphate What is the Proprietary Name? Non-Proprietary Name: Acetaminophen And Codeine Phosphate What is the Non-Proprietary Name? Acetaminophen And Codeine Phosphate with NDC 58118-4484 is a a human prescription drug product labeled by Clinical Solutions Wholesale, Llc. 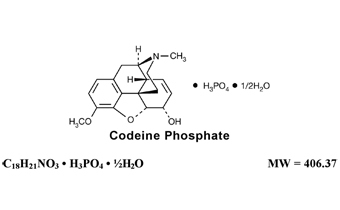 The generic name of Acetaminophen And Codeine Phosphate is acetaminophen and codeine phosphate. The product's dosage form is tablet and is administered via oral form. FDA Application Number: ANDA040419 What is the FDA Application Number? In addition, each tablet contains the following inactive ingredients: crospovidone, magnesium stearate, microcrystalline cellulose, povidone, pregelatinized starch, stearic acid. see ADVERSE REACTIONS). They also stimulate prolactin, growth hormone (GH) secretion, and pancreatic secretion of insulin and glucagon. 24 hours of administration, most as the glucuronide conjugate, with small amounts of other conjugates and unchanged drug. See DRUG ABUSE AND DEPENDENCE). See PRECAUTIONS, Information for Patients/Caregivers). Contact local state professional licensing board or state controlled substances authority for information on how to prevent and detect abuse or diversion of this product. Opioid Analgesic Risk Evaluation and Mitigation Strategy (REMS)To ensure that the benefits of opioid analgesics outweigh the risks of addiction, abuse, and misuse, the Food and Drug Administration (FDA) has required a Risk Evaluation and Mitigation Strategy (REMS) for these products. Under the requirements of the REMS, drug companies with approved opioid analgesic products must make REMS-compliant education programs available to healthcare providers. Healthcare providers are strongly encouraged to do all of the following:Complete a REMS-compliant education program offered by an accredited provider of continuing education (CE) or another education program that includes all the elements of the FDA Education Blueprint for Health Care Providers Involved in the Management or Support of Patients with Pain. 2) retention from opioid-induced respiratory depression can exacerbate the sedating effects of opioids. See DOSAGE AND ADMINISTRATION). Overestimating the acetaminophen and codeine phosphate tablets dosage when converting patients from another opioid product can result in a fatal overdose with the first dose. See OVERDOSAGE). Therefore, individuals who are ultra-rapid metabolizers should not use acetaminophen and codeine phosphate tablets. See PRECAUTIONS, Information for Patients/Caregivers, Pregnancy). See WARNINGS, Life-Threatening Respiratory Depression). See WARNINGS, Life-Threatening Respiratory Depression). Alternatively, consider the use of non-opioid analgesics in these patients. See PRECAUTIONS, Drug Interactions). Monitor these patients for signs of hypotension after initiating or titrating the dosage of acetaminophen and codeine phosphate tablets. In patients with circulatory shock acetaminophen and codeine phosphate tablets may cause vasodilatation that can further reduce cardiac output and blood pressure. Avoid the use of acetaminophen and codeine with circulatory shock. 2 retention can further increase intracranial pressure. Monitor such patients for signs of sedation and respiratory depression, particularly when initiating therapy with acetaminophen and codeine phosphate tablets. See PRECAUTIONS, Information for Patients/Caregivers). See WARNINGS). Instruct patients not to share acetaminophen and codeine phosphate tablets with others and to take steps to protect acetaminophen and codeine phosphate tablets from theft or misuse. See WARNINGS). Advise patients how to recognize respiratory depression and to seek medical attention if breathing difficulties develop. See WARNINGS). Instruct patients to take steps to store acetaminophen and codeine phosphate tablets securely. Advise patients to properly dispose of acetaminophen and codeine phosphate tablets in accordance with local state guidelines and/or regulations. Advise patients not to adjust the dose of acetaminophen and codeine phosphate tablets without consulting a physician or other healthcare professional. See CONTRAINDICATIONS and ADVERSE REACTIONS). See ADVERSE REACTIONS and CLINICAL PHARMACOLOGY). See CLINICAL PHARMACOLOGY), resulting in decreased opioid efficacy or a withdrawal syndrome in patients who had developed physical dependence to codeine. See CLINICAL PHARMACOLOGY), which could increase or prolong both the therapeutic effects and adverse reactions, and may cause serious respiratory depression. 2 basis) for two years. In vitro Chinese hamster ovary cell chromosome aberration assay. See OVERDOSAGE). The effect of codeine, if any, on the later growth, development, and functional maturation of the child is unknown. The following adverse reactions associated with the use of codeine were identified in postmarketing reports. Because some of these reactions were reported voluntarily from a population of uncertain size, it is not always possible to reliably estimate their frequency or establish a causal relationship to drug exposure.Serious adverse reactions associated with codeine are respiratory depression and, to a lesser degree, circulatory depression, respiratory arrest, shock, and cardiac arrest.The most frequently observed adverse reactions with codeine administration include drowsiness, lightheadedness, dizziness, sedation, shortness of breath, nausea, vomiting, sweating, and constipation.Other adverse reactions include allergic reactions, euphoria, dysphoria, abdominal pain, pruritus, rash, thrombocytopenia, and agranulocytosis.Other less frequently observed adverse reactions expected from opioid analgesics, including acetaminophen and codeine phosphate tablets:Cardiovascular System: faintness, flushing, hypotension, palpitations, syncope. Anaphylaxis: Anaphylaxis has been reported with ingredients contained in acetaminophen and codeine phosphate tablets. see DOSAGE AND ADMINISTRATION). If acetaminophen and codeine phosphate tablets are abruptly discontinued in a physically dependent patient, a withdrawal syndrome may occur. Some or all of the following can characterize this syndrome: restlessness, lacrimation, rhinorrhea, yawning, perspiration, chills, myalgia, and mydriasis. Other signs and symptoms also may develop, including: irritability, anxiety, backache, joint pain, weakness, abdominal cramps, insomnia, nausea, anorexia, vomiting, diarrhea, or increased blood pressure, respiratory rate, or heart rate. N-acetylcysteine (NAC) to decrease systemic absorption if acetaminophen ingestion is known or suspected to have occurred within a few hours of presentation. 4 hours or more after ingestion to assess potential risk of hepatotoxicity; acetaminophen levels drawn less than 4 hours post-ingestion may be misleading. To obtain the best possible outcome, (NAC) should be administered as soon as possible where impending or evolving liver injury is suspected. Intravenous NAC may be administered when circumstances preclude oral administration. Initial DosageInitiating Treatment with Acetaminophen and Codeine Phosphate TabletsDosage should be adjusted according to severity of pain and response of the patient. However, it should be kept in mind that tolerance to codeine can develop with continued use and that the incidence of untoward effects is dose related. Adult doses of codeine higher than 60 mg are associated with an increased incidence of adverse reactions and are not associated with greater efficacy.The usual adult dosage is:Acetaminophen and Codeine Phosphate Tablets (codeine 15 mg and acetaminophen 300 mg): Take 1 to 2 tablets every 4 hours as needed for pain. Acetaminophen and Codeine Phosphate Tablets (codeine 30 mg and acetaminophen 300 mg): Take 1 to 2 tablets every 4 hours as needed for pain. Acetaminophen and Codeine Phosphate Tablets (codeine 60 mg and acetaminophen 300 mg): Take one tablet every 4 hours as needed for pain. see WARNINGS). Frequent communication is important among the prescriber, other members of the healthcare team, the patient, and the caregiver/family during periods of changing analgesic requirements, including initial titration. see WARNINGS and DRUG ABUSE AND DEPENDENCE). Each Acetaminophen and Codeine Phosphate Tablet USP 300 mg/15 mg tablet contains acetaminophen 300 mg and codeine phosphate 15 mg. It is available as a round, white to off-white tablet debossed with “2” on one side and an M on the other side.Bottles of 100......................................... NDC 0406-0483-01Each Acetaminophen and Codeine Phosphate Tablet USP 300 mg/30 mg tablet contains acetaminophen 300 mg and codeine phosphate 30 mg. It is available as a round, white to off-white tablet debossed with “3” on one side and an M on the other side.Bottles of 20............................................ NDC 0406-0484-20Bottles of 30............................................ NDC 0406-0484-03Bottles of 50............................................ NDC 0406-0484-50Bottles of 100......................................... NDC 0406-0484-01Bottles of 1000....................................... NDC 0406-0484-10Unit Dose (10 x 10)............................... NDC 0406-0484-62Blister pack of 30………………………NDC 58118-4484-8Each Acetaminophen and Codeine Phosphate Tablet USP 300 mg/60 mg tablet contains acetaminophen 300 mg and codeine phosphate 60 mg. It is available as a round, white to off-white tablet debossed with “4” on one side and an M on the other side.Bottles of 100......................................... NDC 0406-0485-01Bottles of 500......................................... NDC 0406-0485-05Store acetaminophen and codeine phosphate tablets at 20° to 25°C (68° to 77°F) [see USP Controlled Room Temperature].Dispense in tight, light-resistant container as defined in the USP.Mallinckrodt, the “M” brand mark, the Mallinckrodt Pharmaceuticals logo and M are trademarks of a Mallinckrodt company. 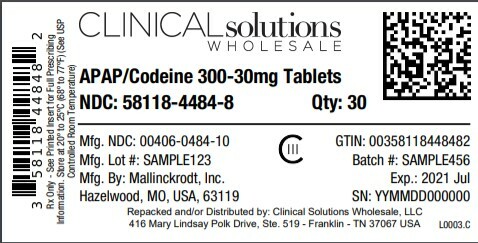 Repackaged by:Clinical Solutions WholesaleFranklin, TN 37067An electronic copy of this medication guide can be obtained from www.mallinckrodt.com/Medguide/MG20A08.pdf or by calling 1-800-778-7898 for alternate delivery options. Medication GuideAcetaminophen and Codeine Phosphate Tablets USP, CIII(a seet' a min' oh fen and koe' deen fos' fate) Acetaminophen and codeine phosphate tablets are:A strong prescription pain medicine that contains an opioid (narcotic) that is used to manage mild to moderate pain, when other pain treatments such as non-opioid pain medicines do not treat your pain well enough or you cannot tolerate them. Important information about acetaminophen and codeine phosphate tablets:Get emergency help right away if you take too many acetaminophen and codeine phosphate tablets (overdose). When you first start taking acetaminophen and codeine phosphate tablets, when your dose is changed, or if you take too much (overdose), serious or life-threatening breathing problems that can lead to death may occur. Taking acetaminophen and codeine tablets with other opioid medicines, benzodiazepines, alcohol, or other central nervous system depressants (including street drugs) can cause severe drowsiness, decreased awareness, breathing problems, coma and death. Never give anyone else your acetaminophen and codeine phosphate tablets. They could die from taking it. Store acetaminophen and codeine phosphate tablets away from children and in a safe place to prevent stealing or abuse. Selling or giving away acetaminophen and codeine phosphate tablets is against the law. Important Information Guiding Use in Pediatric Patients:Do not give acetaminophen and codeine phosphate tablets to a child younger than 12 years of age. Do not give acetaminophen and codeine phosphate tablets to a child younger than 18 years of age after surgery to remove the tonsils and/or adenoids. Avoid giving acetaminophen and codeine phosphate tablets to children between 12 to 18 years of age who have risk factors for breathing problems such as obstructive sleep apnea, obesity, or underlying lung problems. Do not take acetaminophen and codeine phosphate tablets if you have:severe asthma, trouble breathing, or other lung problems. Have been told by your healthcare provider that you are a “rapid metabolizer” of certain medicines. Tell your healthcare provider if you are:pregnant or planning to become pregnant. Prolonged use of acetaminophen and codeine phosphate tablets during pregnancy can cause withdrawal symptoms in your newborn baby that could be life-threatening if not recognized and treated. Taking prescription or over-the-counter medicines, vitamins, or herbal supplements. Taking acetaminophen and codeine phosphate tablets with certain other medicines can cause serious side effects that could lead to death. When taking acetaminophen and codeine phosphate tablets:Do not change your dose. Take acetaminophen and codeine phosphate tablets exactly as prescribed by your healthcare provider. Use the lowest dose possible for the shortest time needed. If you have been taking acetaminophen and codeine phosphate tablets regularly, do not stop taking acetaminophen and codeine phosphate tablets without talking to your healthcare provider. After you stop taking acetaminophen and codeine phosphate tablets, dispose of any unused tablets in accordance with local state guidelines and/or regulations. While taking acetaminophen and codeine phosphate tablets DO NOT:Drive or operate heavy machinery, until you know how acetaminophen and codeine phosphate tablets affect you. Acetaminophen and codeine phosphate tablets can make you sleepy, dizzy, or lightheaded. Drink alcohol or use prescription or over-the-counter medicines that contain alcohol. Using products containing alcohol during treatment with acetaminophen and codeine phosphate tablets may cause you to overdose and die. The possible side effects of acetaminophen and codeine phosphate tablets:constipation, nausea, sleepiness, vomiting, tiredness, headache, dizziness, abdominal pain. Call your healthcare provider if you have any of these symptoms and they are severe. Get emergency medical help if you have:trouble breathing, shortness of breath, fast heartbeat, chest pain, swelling of your face, tongue, or throat, extreme drowsiness, light-headedness when changing positions, feeling faint, agitation, high body temperature, trouble walking, stiff muscles, or mental changes such as confusion. These are not all the possible side effects of acetaminophen and codeine phosphate tablets. Call your doctor for medical advice about side effects. You may report side effects to FDA at 1-800-FDA-1088. For more information go to dailymed.nlm.nih.gov.